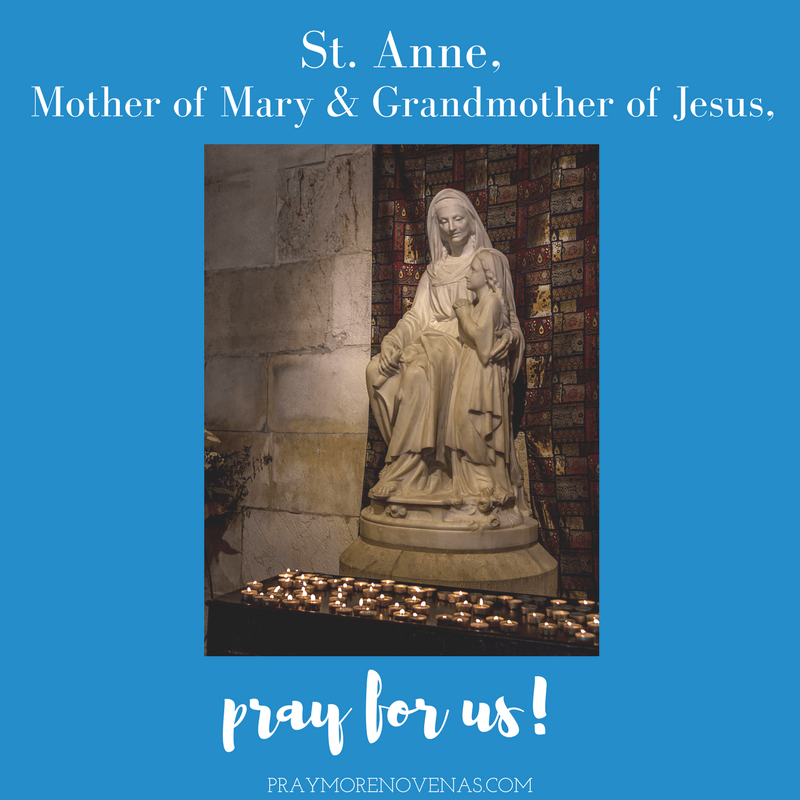 Here’s Day 1 of The St. Anne Novena! Pray I can distribute more Pieta Books, Brown Scapulars & Rosaries to help save more Souls. The Blessed Mother has said that people go to Hell like snowflakes. Please help me pray for PEACE within my family. Blessed St Anne and St Joachim make me more thoughtful of my husband as l struggle with his attitude. Help him to gain the strength to be more sociable and forgive his mother. Bless all my family and friends. In the name of the father. Amen. St. Anne, help me in my legal battle with my ex-wife, who strives to make me suffer, cares not for what is best for the children, and is driven by greed and anger. Help me to forgive her unreasonable, bitter and vindictive behaviour that is not deserved. Help me to keep this house for the children, and provide the stable life for them and me that I have been fighting two years for. St. Anne, help us figure out how to make my father comfortable, and slow down his physical deterioration. St. Anne, please help those who pray for your intercessions. Please ask our heavenly Father to release my heart from BE if he is not the one and if he is the one to please restore us and lead us to marriage. If it is single life give me the grace to embrace and live that life. If it consecration to religioust life please find me the order to join and instill the desire in my heart. Please open the door for me and give me the grace to say yes as I do not have the desire but I will obey with your help and guidance. My heart is for BE but I will do your will please help me. Please pray for my visit with sister Kathy today to go well. Give her the wisdom to lead me to the path you have destined for me. Holy Spirit be all over our visit. Be all over my prayer intentions. Mama Anne please interceed for BE to fall in love with Mother Mary so she can lead him to Christ please. Please Mama Anne take my thoughts and hearts desires and make it match God’s thoughts and desires and desires for me 100%. Any of them that do not match 100% please remove them and ask God to please then bless me with those thoughts and desires he has for me. Please ask God to guide me to the right path. If I am on the wrong path or praying for the wrong things that are not his will to redirect me thoughts and desires. I relinquish my free will and ask God to move in and guide me to the right path. Mama Anne I’m drowning please hear and help me please Mama help me. I pray for everyone praying this Novena that God would grant us all our hearts desires that according to his will for us. I pray for John Paul and Annie’s special intentions. I pray all these in the Mighty name of Jesus. Thank you Father, thank you Son, thank you Holy Spirit. Amen! Saint Anne please bring to me a loving husband. Amen . That there is peace in my life with my sons when we come together. Come Holy Spirit and fill us with Your Grace! Give me the words as you would speak of Love, Peace and Hope! This outstanding loan with the condo association. For Barb K., diagnosed with recurrent cancer, that she be healed spiritually, and if it be the will of God, that she receive physical healing. For Father Jeff, that he may increase in holiness and that miracles may continue to be granted through his intercession. For my parish community, that we may be joyful missionary disciples and so attract others to faith and to relationship with Jesus Christ. For the intentions of all who are praying this Novena. We are desperate. We need work and money. St Anne pray for us! St. Anne,please help me find a husband that will be a true life partner and best friend. I’ve had so much heartbreak that I was avoiding everything good in life. Please help me renew my faith and strenght in our Lord Jesus Christ. Also assist and intercede on my behalf to Jesus for a new exciting and fulfilling job and career, Jesus I am asking that you bless me fruitfully with faith, love, health, finances. I am declaring that 2018 I will be married to my life partner/best friend and husband. I pray that my daughter find a good husband. She is very lonely and would make a wonderful wife. Praying that my son find peace with his demanding job and to enjoy working again. Praying that my son and daughter-in-law be healed of their fertility problems and conceive a healthy baby. That my future husband will come, and that he will love You first & foremost, even before loving me. That I can continue to do your will no matter what vocation. That I can successfully be accepted into graduate school, achieve my M.A., and evangelize even through my secular work. That my friend F.R. will also have faith that our Father have plans for her & her future spouse. That my family strengthen their faith & trust in Him, & be eager to speak of the Catholic faith. Please pray for my mama. She has been the best mother and grandmother to all of us. Please give her strength and let her get better. I ask that my will be aligned with the will of Jesus. I ask that my brother and his family and my family that left the Church become believers in Jesus Christ and return to the Church. I ask that I find a home where you want me to be so that I can do your will. In Jesus’ name I ask with thanksgiving. about in the near future. Praying that my car will be fixed soon and I will be able to drive to my new job. This I pray in Jesus Holy Name . Amen. Must one be Catholic in order to pray Novenas? Please intercede for us with your Blessed daughter and grandson. Please bring our home a new family that will love it as much as we did. Please bring new families to our small town who will spread the word of the Lord to our church and school community. Please help us have patience to wait for this family to buy our home. It’s been over a year and we are getting very weary. Please hear our prayers. Thank you so much for your prayers and intercession St. Anne. Pray for healing spiritually / physically especially on my severely painful knee, Amen. We pray for all the souls of the faithful departed. Pray for peace through out the world. Help brother Joey with his alcohol addiction. Dear St. Anne, I ask not for myself but for my friends, family & people around the world. I pray for that all my friends & other people going through immigration issues. In particular, I pray for B. C. F. & P.T. C., that you grant them their heart desires & permanent immigration status wherever they seek refuge to call home. I know through you to Christ our Lord Jesus Christ; all prayers are answered Amen. St. Anne, I’m ready. Please help me find a husband that will be a true life partner and best friend. I’ve had so much heartbreak that I was avoiding everything good in life. Please bring some good my way. Your intention is the first one I read and i love that it’s exactly what I just finished praying for. May all our prayers get answered through this beautiful Novena and St. Anne’s intercession. God Bless You! Asking for prayers for my two oldest daughters that they come back to the Church and for my other six to remain faithful. Saint Ann, pray for us. Dear St. Anne, please find a replacement coworker that will help us run our building harmoniously. Keep Kim in your prayers to be able to deal with life and cancer. Last Monday, I was on my way to a Dr’s appointment. I was very flustered because I was running late. In my mind I was praying that every thing would go well. I had been having vertigo for about 6 days and I was very frustrated with my self at that point. In my mind I was wandering if I should have not instead canceled my appointment and rescheduled. I was approaching a very busy section of the high way and the cars were going very fast. I always have my radio on and I listen to Sirius Radio, most of the time on Escape. As I drove down the hiway, in my mind I asked the Lord if I had made the right decision. At that moment the song playing had ended and a new song came on, the title of that songs is well known, it is called “ Vaya Con Dios” (Go With God). I could not believe it, for a moment I felt that God had answered me. Then I knew he had! Tears ran down my cheek and I kept saying, He has answered me, He has answered me. Saint Anne pray for me that I will stay healthy in order to care for my ailing husband. Amen. I ask for your intercession for my intentions. For continual health for my mom, healing for the wounds in my heart, and that I may see myself as God sees me. Please help me with my problematic family and with my husband and his double-life. Please keep in your prayers and intentions my father, who will be 90 years old in about a week. Help him to keep the little strength that he still has and help him, and my mother, with the little bit confusion he sometimes has. Give my parents strength to help each other and to be there for each other until they may be called to be with all the saints and theHoly Trinity in heaven forever. For my daughter, that she would be blessed with a loving, faithful husband united in sacramental marriage in the Holy Roman Catholic Church , and that they would be blessed with healthy children. For my friend’s son & daughter in law, that they would healed of infertility and be able to conceive and bear a healthy child. I pray , in thanksgiving to our Lord and our Blessed Mother’s, for baby Hayley,named after the Hail Mary , who was born this year to my Godson and his wife after much prayer due to infertility issues. , and in thanksgiving to my other Godson, niece and nephew, also all born to my sister who struggled with infertility issues. !!! That my daughter breaks down the Barrier walls between her and Lord Jesus Christ, that she can come to know him personally in her heart and soul. I pray for her joy and happiness in finding the Lord. I also pray for my husband that God shows him wisdom and direction for his business. I also pray for my mom has peace and Health . Please pray for me for happiness and bless me with a strong man that i can call my husband one day. My mind is on one but my heart is with another. Please watch over my son to clear his mind of all negative thoughts. Make is mind strong and focused. Return of my family to the Catholic Church, conversion of my daughters family & my sons future wife & family. That we will all be active participants in the holy sacraments & mass. Bless mine & my daughter marriage s; my son will find loving, faithful,christian lady to marry who will convert if not catholic. Repose of Susie’s soyul & comforts to those who cared for & loved her. and also get counseling for him. so our family can heal. St. Anne-I pray that I can find my life’s partner. I am seeing someone now who I think may be the one. Please help guide us, show us the way to bring Jesus to the center of our relationship. Help mold our relationship to be a lifelong partnership if that is the will of God. Help me discern if this man is the one that God has planned for me. Please watch over and guide my sister and brother-in-law that they may have a long and happy marriage. Good morning, please pray for me. I know I shouldn’t worry and I should believe and trust in God. But I need a favor, I need a full time job close to home. I’m currently working at a part time job but it’s very slow during the summer and I don’t make enough to pay my mortgage, food and monthly bills. It’s been a very long time since I’ve been low on income. I barely have enough to put gas in my gas tank. I feel so embarrassed to ask for help all I do is cry, but crying doesn’t get me anywhere. I’m a single parent please God hear me help me please. I pray for Hannah, may she be healed St. Anne. May she be favoured by the the Lord. St Anne I pray for Adam, may he grow to love the Lord and be a loving, supportive, kind and loyal partner. May he find work that is better paying so he is able to take care of his family(us). St Anne may he find favour with the Lord & yourself. May he be a leader of men, be the head and not the tail in all situations in life. St Anne I pray for my sister Joan, may she find work. May the many applications sent out come back with positive results. St Anne I pray for Doreen, please protect her and guide her in her work. May she not grow tired of the work that she does for us. May she love, protect my baby and treat her right. Do right by my baby as I do right by her. Blessed St Anne help my son find peace in his new job and that Steph will keep well. Bless all my family and friends and pray for a better world where riches are shared and people care for each other. Just recently I went through a terrible relationship. Learning that his love for me was never sincere, led me to depression and suicidal thoughts. I strongly believe that I had to ask God before I went into this relation. He frequently stressed me out and his attitude was not pleasing. Please St. Anne pray for me to give me someone worthy and sincere in his relationship. Please help me to find for a right partner in marriage even though i am a bit too old to settle down and with God’s grace nothing is impossible. I pray for success in my exams. That God may grant me the job that I seek. I pray also that God may protect, guide and guard my family especially for safe trip for my brother in law and sons. My prayer intention is for my future husband. I recently got out of a serious relationship who I thought I would marry. I thought we were on the same page, but turned out we weren’t. I thought God was calling me to him, but he was then calling me to move on. Now I’m looking for my Mr. Right who God is calling me to be with forever. Please pray for the restoration of our relationship w our daughter; that we might be allowed to see our grandchild and that her and her child might be protected. Please also pray that our daughter and two sons may have a personal encounter w Jesus and return to the faith. Thank you for all your benefits and love. Take care of my daughter Cristina and all my family. Jesus you chose Saint Anne for your family Please take care of my family. St. Anne, please pray for my family to grow in the love of Jesus Christ and to continuously gain good mental/emotional and physical health and strength in their life. Please pray to the Lord to send my daughter and son spouses who are humble, loving and kind and love Jesus Christ. Please pray for M.S. to seek to improve her relationship with her daughthers. Please watch over and guide our daughters. Jenn who is ill and not has able to conceive a baby. May she sell that old house and see if that is the causes of her illnesses. Val who is considering marriage to a boy from a very dysfunctional family. May she choose wisely and not face the medical problems her sister has faced. Michael, stubborn man that he see a doctor and get some help for his health issues before they get the better of him. Thank you for all our blessings and love. Please pray for my brother and sister in law who are finally pregnant after over a year of trying, but are afraid they may be miscarrying. God, bless them with this baby if it be Your Will, but please keep her safe and healthy to being this baby into the world. For the signal graces to be a good mom and a good grandmom, like St. Anne! For help in getting us through some difficult financial times. And for my friend Barb; she has several health issues and must continue to work to help support her son’s growing family. I Pray for the wisdom and understanding to pass my usmle step 3. exams and match for residency. to find a faith filled loving husband and for my siblings to have fulfilling careers and family lives. for financial growth for all my family members and for the wisdom to live to my full potential. please guide my daughters to make right decisions in their lives and lead them to good men, who will share their catholic faith. St.Anne praying for my sister-Jen’s eye operation on this coming 27 July 2018…….Pray for my brother S & sister G in their health to stay strong……..Pray for my digestive system. I am begging you to please help me with all my transactions. Let all the transactions of my team to be successful. I need these in order for me to get the custody of my children. Please St Anne I am begging you to grant me the peace of mind and may I have a place in my heart to forgive my family in destroying my life and my children. Please protect my daughters and granddaughters and show them the way to have the best lives possible with your help. I praying for my 4 year old grandson who has autism. I pray for a miracle that he would learn talk and communicate with us. I also pray for his mother that she would do right by him in spending more time in helping him . I will pray for peace to return to your heart. Losing a parent is so traumatic and heartbreaking. Trust our lady to bring you comfort. Our Lord will get you through this in time. Your mother is watching and praying over you and your children. Lord I pray for money to finance my son throughout medical school. St Anne intercede for me.My son tuition fees are due now. I am praying for a financial breakthrough. I pray for everyone’s intentions. Please guide them to full reconciliation. May their hearts be filled with peace today. I pray specifically for healing for Nicole. Please guide and direct the doctors to fine a cure. I pray for clarity in my relationship with S and for my annulments to finally be completed. Thank you for intercepting on our behalf. Pray for us St. Anne. Praying that my son will find a suitable young lady that he will one day make his wife. Also pray that his anger problems will be healed. Please pray that we keep our home. My husband needs this raise to help us keep our home. St Anne, I am praying for the love of my life been with him for the past 25 years and I want him to make me a honest woman. So I could receive communion at church. We are both divorced. But my priest told me that we should get married. I am praying for him to ask me to married him. Amen! Blessed Saint Anne mother of our blessed mother Mary and grandmother to our loving Jesus, I ask that you pray along with me to not have my cancer return or spread. And to send a wonderful loving kind man into my life so I may have the joy of a family. Please pray for my mother who is in recovering from nammonia and aid her in her physical therapy Please Saint Anne help me to be a stronger Catholic and aid me in building my relationship with Jesus and the Blessed Virgin mother. For help in addressing some fears I have at work. I pray for their total deliverance and that they resume school normally like any other children of God. God’s forgiveness for my husband and I divorcing. If it be God’s will to reunite us so we can help each other get to heaven and teach other couples to pray together so they can fight the enemy to stay together. If this is not be God’s will for me then I ask God to help me be at peace with our decision and for me to surrender to God’s new and holy plan for my life. Forgiving my Ex completely. dear St..Anne ..please help me and blessed me to be the topnochers of nursing licensure examination on this coming November 17 and 18 with the average of 88%…Give me more knowledge wisdom and concentration focus while I’m reviewing….I begged you St.Anne .this is my last board exam i got..AMEN..